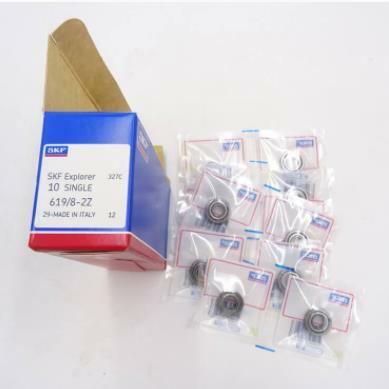 SKF brand 619-8 bearing is a type of deep groove ball bearings,it is made in Italy.Sizes of miniature deep groove ball bearing 619/8 are: inner diameter--8 mm,outer diameter--19 mm,thickness--6 mm.There are two metal seals on both sides of 619/8 deep groove ball bearing. Large ready stock and fastest delivery in 1 day,best service for you. Principal dimensions Basic load ratings Reference speed Limiting speed Model no.